The North Atlantic Treaty Organization (NATO) was created in 1949 to safeguard the freedom and security of its member countries by political and military means. Nearly 60 years later, NATO found itself with a new mission: Helping to establish the conditions in which Afghanistan might enjoyafter decades of conflict, destruction and poverty a representative government as well as self-sustaining peace and security. The International Security Assistance Force (ISAF) mission in Afghanistan would be challenging for any military organization. It is doubly so for a force composed of units speaking different languages and using different equipment. Simply achieving what the military calls situational awareness knowledge shared by commanders and troops about the battle spacepresents an enormous challenge. NATOs Allied Command Operations in Casteau, Belgium, directs ISAF operations. However, a separate group Allied Command Transformation (ACT) in Norfolk, Virginia, USAfocuses on preparing NATO for its future. To support the ISAF, ACT began working with contractors to specify and design a Force Tracking System (FTS) that could be used by all NATO units in Afghanistan to share information and prevent friendly-fire casualties. The result was a first for NATO: A standard called the NATO Friendly Force Identifier (NFFI), which defined how existing FTS used by some nations would interoperate with one another and with new systems to be developed by NATO. Development of the standard was no laboratory exercise. There was enormous pressure to develop a unified system that would protect soldiers and make operations more effective. The requirement went out to contractors in 2005, and after a competitive bidding process and contract award by the NATO Consultation, Command and Control Agency (NC3A), the standard was ready in December 2006. In between were countless technical meetings with contractors as well as ongoing design and testing. The original bidding was won by Insight (now Comtech Mobile Data Corp.) and EMS Technologies of Canada. The requirement called for vehicle mounted systems with visual displays using GPS to track their own locations. The systems would also share this information with field commanders and other units. Based on the NFFI standard, the system would fully interoperate with the FTS units brought into Afghanistan by troops from the missions Participating Nations. Visual displays in each vehicle, and in command centers, used a common database to represent friendly forces on dynamic maps. The plan also called for equipping the vehicles and command centers with keyboards for the exchange of text messages. The technology appeared promising. The problem was to deploy the system in Afghanistan and integrate it into vehicles, all the while maintaining operations in one of the worlds toughest environments. The terrain of Afghanistan is incredibly mountainous, making line-of-sight communications almost useless. The region is dry and dustyas soon as the dust is disturbed, it rises into the air and seeps into every piece of equipment. Add in the fact that the units of the Participating Nations also rotate out on a regular basis, this means a continuous need to retrain the new forces and reinstall and re-commission systems. At that time, a team of Globecomm engineers and Afghani technicians was already in-country building and maintaining a national mobile phone network and private networks for the Afghan government. In June 2006, Globecomm won a new competition organized by the NC3A to manufacture the FTS vehicle systems, integrate ground systems and a control suite, and provide installation, training and maintenance for NATO forces. The company shipped the first suitcase-size units to Afghanistan by October. After systems integration, antenna commissioning and terminal testing, Globecomm had the first units in vehicles by the end of November, even before the final NFFI standard was approved. Thats when things began to get interesting, said Globecomm vice president Paul Knudsen. There were lots of technology challenges. 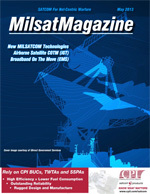 The complexity of the satellite and terrestrial link was unique. Signals from the FTS units were relayed via satellite to Europe and were then backhauled terrestrially to North America and transmitted to the ISAF HQ in Afghanistan. Thats where the control suite compiled and processed the data, which was transmitted back through the same chain to the individual terminals in the vehicles. On any given day, there are hundreds of vehicles using the terminals. But there is a far more serious benefit for soldiers on the ground. ISAF in Afghanistan operates in multiple languages, with English as the primary language and French as the backup. But many of the troops have minimal skill in either. Texting allows troops to communicate adequately even when they are not fluent enough to speak. With text, a soldier never has trouble understanding anothers accent. NATOs FTS was declared operational in early 2008 and will continue in use throughout the ISAFs deployment in Afghanistan.